Dishing up a home-cooked dinner for just two people can seem like a challenge. Popular recipes such as lasagna, stews and roast chicken are aimed at family suppers and are tricky to scale down. Cook a batch of chili for you plus one and chances are that it will still be lurking in your fridge days later. Who wants to be endlessly eating leftovers? Using up fresh ingredients is also a problem when you are cooking for two – whether you are a married couple or two college roommates. Limp salad greens and half-used bottles of expired salad dressing are typical of a duo’s culinary dilemma. Finally, lack of time is an issue when it comes to the supper hour – whether you are one, two or a tribe of six. My significant other and I are both busy empty nesters. Three or four nights a week we make dinner together. With practise we’ve found seasoned solutions that deliver delicious meals with no fuss and minimum clean up. It’s no longer a chore, it’s a pleasure. We relax, catch up on our days and smile at the knowledge that having another human being at the table is sparing us the indignity of talking to the plants! I’ll be presenting a Cooking for Two class with Metro Continuing Education on Saturday February 9, 2019 where I will share great recipes and lots of tips. Meanwhile, here are a few suggestions to get you started. Ditch the pot roasts in favour of stir-fries, one-dish dinners and interesting salads. Hearty soups, grilled sandwiches and flatbreads also fit the bill. I sold my 6-litre slow cooker and generally cook with a 10-inch skillet, a baking dish, medium saucepan or a baking sheet. Smaller quantities need smaller equipment. Stock up on bold ingredients that provide the base for or add zip to a dish – curry pastes, jars of roasted red peppers, sundried tomatoes, artichokes, olives and pesto. Once opened most of these ingredients will keep for several weeks in the fridge. With a good extra virgin olive oil, apple cider vinegar and Dijon mustard on hand you can always whip up a fresh salad dressing. To reduce food wastage, plan several meals for the week to use up perishable ingredients. A bag of spinach, for instance, can be used in salad, stirred into hot soup, sprinkled on pizza or added to a pasta sauce. Cooking from scratch is noble. But it’s OK to reach for a convenience food to get you started. For a satisfying pasta dish, combine a jar of tomato sauce with chicken and mushrooms, toss with cooked rigatoni and garnish with shredded fresh basil and a whack of fresh parmesan. Mama mia! If all you have in the fridge is a couple of flour tortillas, a tail end of cheese, an apple and some cooked chicken – make a quesadilla. Not feeling creative? Search online for recipes using the ingredients you have. A fuss-free, scaled down version of your favourite roast supper. Cooking the bone-in chicken with skin on helps to keep the meat moist and flavourful. Preheat oven to 375°F (190°C). Grease a large, shallow baking dish. Brush chicken with 1 Tbsp oil. Season well with salt and pepper. In a bowl, combine potatoes, garlic, onion, red pepper, thyme, 1/2 tsp salt and several grinds of the pepper mill. Add remaining oil and toss to coat vegetables. Place the chicken in the centre of the prepared baking dish. Arrange vegetable mixture in a single layer, around the chicken. Roast for 30 minutes, stirring the vegetables twice to prevent . Remove from oven and stir vegetables again. Add the lemon and tomato wedges to the baking dish. Return to oven and roast for another 10 to 20 minutes or until chicken is well browned and no longer pink inside and vegetables are tender. 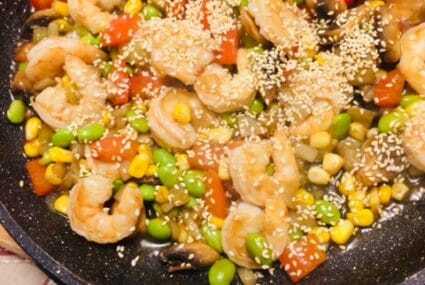 This zesty stir-fry comes together in minutes with ingredients that you can keep on hand. Make sauce: In a small bowl whisk together 1 Tbsp water and cornstarch. Add sweet chili sauce, soy sauce, remaining water and lemon zest. Set aside. Blot shrimp dry on paper towels. Set aside. In a non-stick skillet, heat oil over medium high heat. Add red pepper and cook for about 2 minutes, until pepper is tender crisp. Add garlic and cook till fragrant, about 15 seconds. Add sauce, shrimp, edamame beans and corn; bring to a boil, stirring. Reduce heat and simmer, stirring, for about 2 minutes until shrimp turn pink and sauce thickens. (If the sauce appears too thick for your taste, add additional cold water, 1 tsp at a time to reach desired consistency). Serve over steamed rice, garnished with sesame seeds. 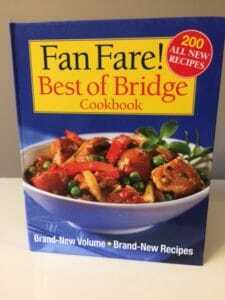 Sally is a recipe development expert and former chef for the Best of Bridge recipe books. Want to take a class with Sally? She’s teaching three classes with Metro this winter, Cooking for Two, Crepeolicious, and The New Dish on Fish.